Multi-port valves are known as rotary type backwash valve. It replaces up to 6 regular gate valves and serves various functions as backwash, rinse etc. Multiport valves are designed for maximum performance and working pressures. Available in 1 ½ and 2 inch for top mount and side mount models. These valves feature a solid constructed of molded ABS mixed UV materials with heavy-duty plastic handles, PVC socket which permits leak-free solvent welds to PVC piping, which is purposed to top position of world standard by the strict quality controlling systems. 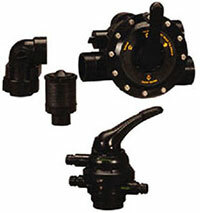 We offer manual, semi or fully automatic multiport valves of different sizes starting from 20NB.